In April of 2015 I set out on my first black bear hunt. This in itself was a big accomplishment for me because bears are one of just a few animals I grew up fearful of. I think it is mostly due to the many family stories, told around the campfire, of various bear encounters. My family is from a rural area just outside of Eugene, Oregon, and if there is one thing we have a lot of on our ranch… it’s bears! Every summer I make my way home for the family reunion and almost every summer we encounter a bear somewhere on the ranch. 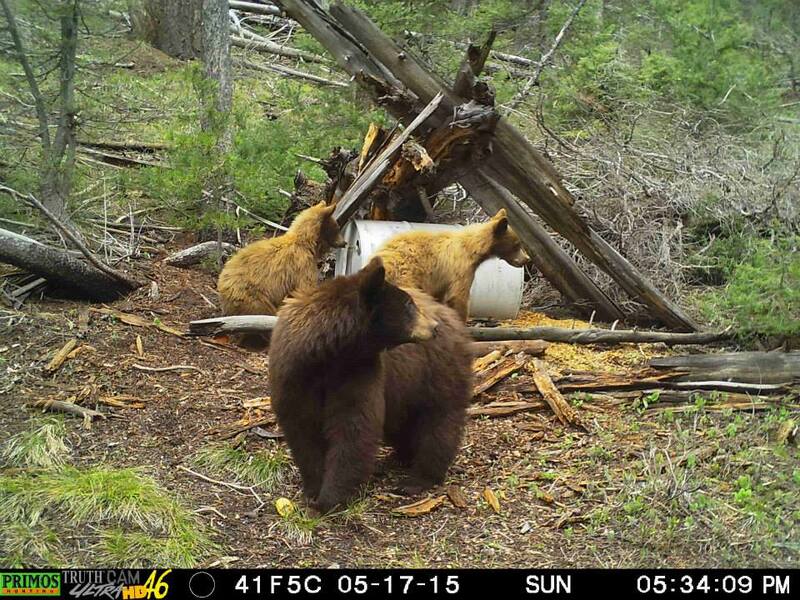 Most of them are small bears moving fast in the opposite direction, but the sighting leads to stories of the big bear(s), past and present, wreaking havoc on the ranch. The funny thing is, only twice have I seen one while we were hunting, and never were they aggressive towards us. So, with that I decided to buy a tag and conquer my fear. Mid-month I headed about two hours northwest of our home to a mountainous area above Fairfield, Idaho. To say it’s beautiful here is an understatement. The trees and mountains remind me a lot of the coastal range in Oregon. But, how you hunt bears in Idaho is very different than how you hunt bears in Oregon. 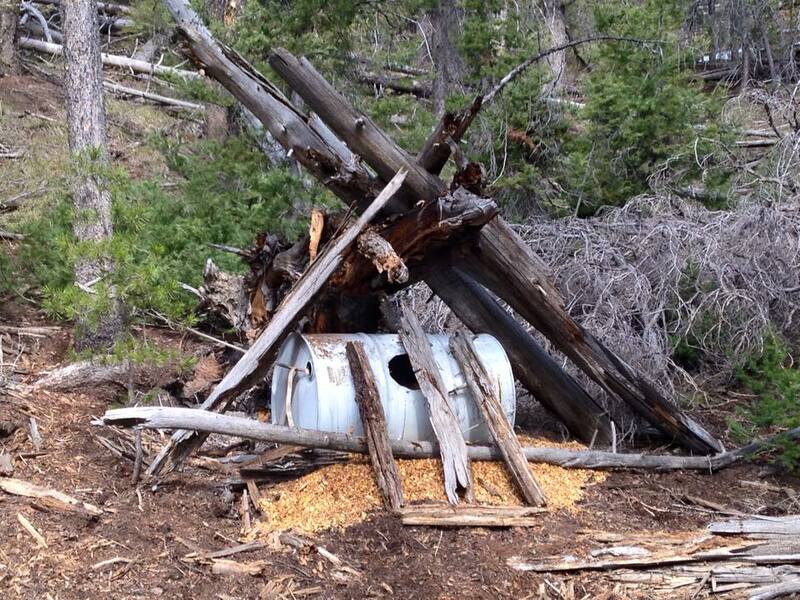 In Idaho we’re allowed to bait bears and use dogs. We decided to try bait. Since my husband and I don’t know much about it, we turned to our friends for advice. I love doing this because each person who gave us recommendations, you know “expert” advice, the surefire way to lure a bear in, contradicted what someone else had already told us. Armed with a wide-array of information, we scoured the hills looking for the perfect place to put our barrel. After much deliberation we settled on a spot and began preparing our bear feast. It was a culinary masterpiece complete with sweet oats, molasses, bread, apples, oranges (which it turns out bears don’t really like) and coffee for good measure. Then, there was nothing left to do, but let it sit. A week or so later we returned hopeful for any sign of a bear or that a bear was frequenting the area, but much to our disappointment we’d been skunked. Disappointed, but by no means defeated, we packed up our barrel and headed north above Ketchum, Idaho. This was initially the area we wanted to be in; however, access to the best bear hunting areas stay closed until about the 1st of May. Once again we set forth creating the “perfect” bear cuisine. This time we added old fryer oil we got from a restaurant and dog food, as an extra temptation. Of course, this came as a recommendation from another friend who said “You’re not getting any bears because you’re using the wrong bait!” Who are we to argue? This is our first attempt at this. So, once again we let it sit. Mother’s Day, as a little gift to myself, we decided to run up early in the morning and check our latest experiment. 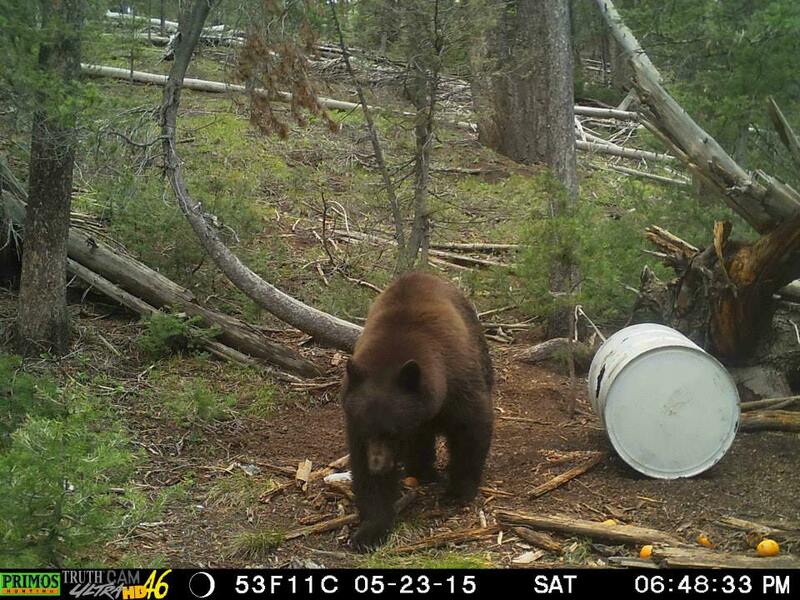 Unfortunately, we didn’t see any bears that day, but when we got the trail camera home we were excited about who had been visiting our sweet little set up. One sly little fox has made himself quite comfortable; coming in every day and helping himself to the goodies. 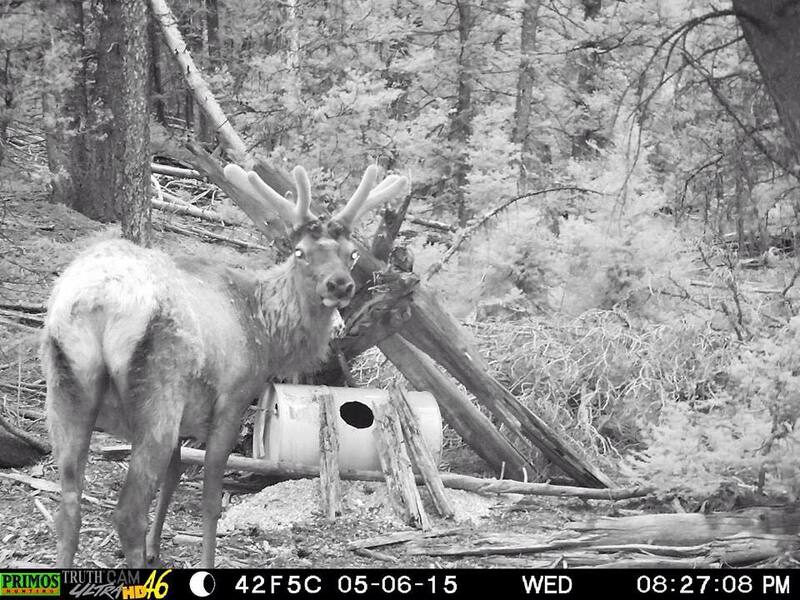 Plus, there was a nice bull elk in the velvet who must of found the sweet oats while passing by. Week three and we’re back at it. This time we had the entire weekend to get the job done. First, we checked the bait barrel, but no sign of bear. Then, we spent the rest of the day scouring the hillsides, glassing for any sign of a black bear. It was an uncharacteristically nasty day with hail storms and downpours popping up periodically. Needless to say we were unsuccessful. With forecasts predicting bad weather all weekend. We decided to pack it in and wait for better weather. One week later we returned, fully prepared to pull the bait barrel and call it a season. That’s when we finally caught a break. Yep! We got a bear. What we didn’t realize at the time is that we had lots of bears! Big bears, little bears and everything in-between. Now we were in business. We made a quick trip to town to grab some items to rebait the barrel and we headed home. When we checked the trail cams we couldn’t believe it. We had several nice boars and a sow and cubs coming in like clockwork each day. 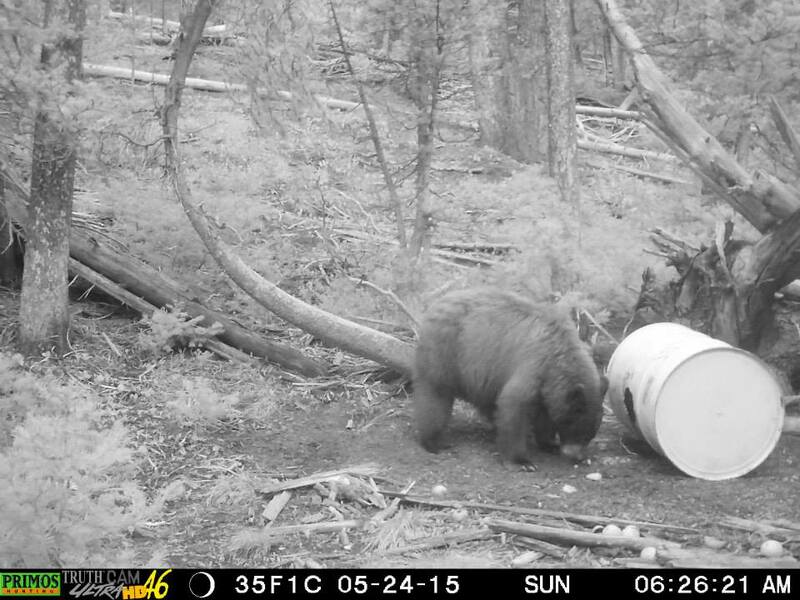 Three days later Ty returned in the late afternoon in pursuit of the big bear we caught on camera. Sure enough, at around 8:30 p.m., which is right around the time he’d been coming in every day, the bear arrived. He spotted the bear coming down the hillside above the barrel. He got within about 60 yards and stopped, he stuck his nose in the air and sniffed several times. Realizing something wasn’t right he sat down with his chest facing down hill. Ty knew it was now or never… he pulled up, put his sights on his chest… and pulled the trigger. The bear only ran about 10 yards and fell over. He ended up squaring at 6’8″. A day and a half later, running on two hours of sleep, we returned together early in the morning, reaching the blind at about 4:30 a.m. I only had until 11 a.m. to hunt because I had to be back at work by 2 p.m. By 7:15 a.m. I was starting think it may not happen. Then, without making a sound a big beautiful cinnamon colored bear appeared on the hillside behind the barrel. It amazes me how quiet such a large animal can be. They always seem to appear likes ghosts, out of thin air. By the time I spotted him in the thick brush he was only about 40 yards from the barrel. Slow and steady, and without an ounce of caution, he made his way down the hill. I readied my rifle and watched as he began to feed. He was standing just so I couldn’t get a clean shot. I told Ty as soon as he swings his backside around I’m taking the shot. Seconds later he did. I pulled the trigger. He rolled up and went down hard. I quickly reloaded, but he had already gotten up and headed off through the brush. I couldn’t get a clean shot. I ran out the backside of the blind, but he had disappeared. I waited and listened. That’s when we heard a huge crash. Ty and I tentatively made our way to the barrel, checked for blood… nothing. We then walked in the direction of the crash. Ty was on his toes looking over the shrubs when he saw the bear laying behind a downed tree. He was still breathing. I looked to see which way he was facing, found his vitals, and just as I did he sat up… I pulled the trigger. The boar squared at 6’4″. Ty and I ended the season with two respectable Idaho black bears. Once again I’m reminded of the need for patience and perseverance, especially when setting out on a new hunting endeavor. I’m grateful for our friends’ expert advice because without it the season likely would’ve been a bust. Click Ty’s picture with his boar above to see video of his hunt.